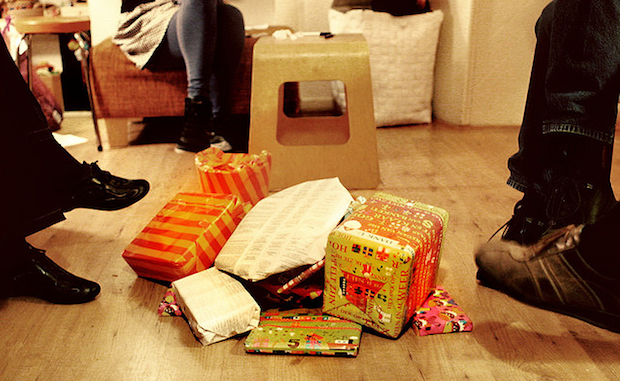 Organizing a group-bought gift for someone special can be a gigantic hassle. Enter Shareagift–which leverages social networking, online payments, and gift-suggestion algorithms–to sweeten the whole deal. The system is, as many great ideas often are, essentially very simple at its core. By taking the collaborative gift-buying system online–as a generic model so you can select any gift, and form a group of whatever size you want–Shareagift is trying to take much of the pain out of the process. Instead of crafting individual emails to friends and colleagues or making phone calls and keeping track of who’s paid what and how much off the group total target the current funds are by scribbling on pieces of paper, Shareagift’s system is designed to deal with all this hassle for the gift organizer. 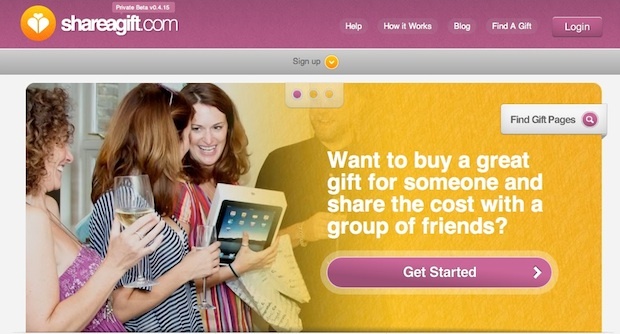 This person, who can be anyone over 18 anywhere in the world, simply signs up, creates a unique page for the gift in question–which can be any gift online or off, or found via Shareagift’s advertising partners via the Findagift tool–and then invites friends and acquintances via email. The buyers then visit the page, paying via the site’s pay mechanisms–which support credit cards, debit cards, and PayPal–and when the fund total is achieved, the site creator returns, withdraws the money and buys the gift. There’s even a touch of gamification because the gift total progress is shown as a growing pie chart, with a list of which invitees have already contributed, and invitees can upload photos and messages to the site–ostensibly to act as a heartfelt journal which can be given to the gift recipient along with the gift, but it’s likely (knowing human nature) that many a gift invitee list will include some hearty teasing about who’s buying and who isn’t. Founder Justine Angelli (also CEO of Absolute Technology Portfolio, a venture capital incubator) spoke to Fast Company about the launch: “The site pretty much does as it says on the box: It’s a website that lets groups of friends or acquaintances buy gifts together.” According to Angelli, it’s the “only site of its kind that’s dedicated to group gift buying” and the idea was dreamed up when a cousin was collecting money for a gift of a computer for a family member, and the struggle to gather the money in time inspired her to think of a better way to do it. Angelli also highlights that the system functions in work environments where you may not necessarily know the person organizing a group gift, and may be wary of giving bank details and so on. “In these rather hard economic times, when people don’t have the money to waste on presents” Shareagift offers a highly targeted and simple way to ensure that if you want to get a gift for someone, it’s something of value–from a pooled resource–rather than a meaningless trinket. The system is viral by nature, because once a gift organizer uploads their contact list from an email provider, Shareagift organizes it, allowing you to simply tick the relevant recipients, who then learn of the service and the gift opportunity at the same time. Plus, unlike other group-pooling funding systems (like Kickstarter) the center of the service is a pleasant, fun, and personal event. Shareagift makes its money only by taking a cut from the donations in the same way that a credit card processing fee would be taken as part of the transaction. It’s launching in beta, worldwide, today.